It sounds the biz, with tons of sound shaping and sequencing options. Great for any setup. Beautiful analogue sound. Super-deep and varied sequencing abilities. High-quality send effects. Keyboard buttons too small for intricate playing. Plastic buttons. Small screen. Until now, all Elektron's products have existed entirely in the digital domain, with digital samples and modelled synth engines, although its Sidstation had an analogue filter. At its heart the A4 is a four-voice analogue synth featuring two DCOs (digitally controlled analogue oscillators, not digital oscillators) per voice, with a sequencer track per voice (four tracks), an FX track and a CV track for controlling voltage controlled gear. Plus, an analogue ladder filter and multi-mode filter. Before you get too excited, the synth can't be played as a polyphonic analogue synth (yet) from a MIDI keyboard (like the DSI Tempest), but you could build chords out of four monophonic synths, using the same sound across four tracks. 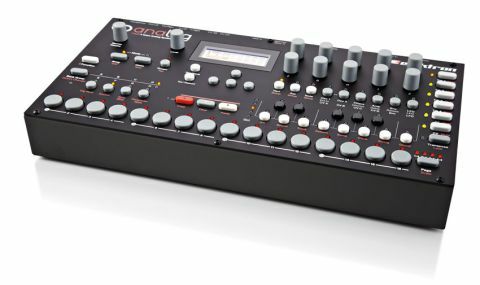 "The dials feel great, with a grippy rubberised texture, and many of them have push button functionality too for selecting values"
Elektron gear always has a very utilitarian feel to it and that is continued here. The A4 is housed in a tough dark grey metal enclosure with a few vents to dissipate the analogue heat. The build quality is very solid, though we would have preferred a slight tilt to the control surface for extra comfort. For those that want to rack it up, there's a rack kit available too. The screen is a little smaller than we would have ideally liked (and smaller than on other recent Elektron products) which is a pity, particularly as you tend to rely on the screen for most of the editing tasks, and end up referring to it to remind you what is assigned to the ten dials to the right of the screen. It would have been nice to have had dedicated controls for the amp/filter ADSRs and filter cutoff/ resonance, but as there is so much under the hood already it would have probably increased the cost and size of the Analog Four considerably. There are plenty of real-time buttons, dials and LEDs to denote the selected function mode or sequencer step. The dials feel great, with a grippy rubberised texture, and many of them have push button functionality too for selecting values. We're not taken with the feel of the hard plastic buttons, and feel they cheapen the otherwise quality feel. Rubberised buttons would have been more inviting. Taking a quick look at the panel, it's divided into sections to keep things neat, though it's quite heavy on the eyes as there are so many features. At the bottom are 16 buttons used for step sequencing and for selecting beats in combination with the bank/ group buttons. Simply mute in and out steps here, or you can lock different parameters to each step for detailed variations. "The learning curve is initially steep, but addictive at the same time. The A4 has a real knack of drawing you in"
Up to 128 'parameter locks' can be used across the sequencer steps, including changing the whole sound on each step (sound locking), or you could set a different filter cutoff value for each step, or pretty much any other parameter. This is one of the most fun things about Elektron boxes, and we wish our Tempest could do this. Sound-locking is also very useful for getting round the four-track limitation; you could insert a bass sound on the first four steps and then a kick drum on the next four (for example), getting you extra mileage out of one track. If you haven't used Elektron gear before then it's likely to be a little overwhelming at first, so we strongly suggest downloading the decent manual from the Elektron site and reading it thoroughly. Even if you have used Elektron gear previously, the learning curve is initially steep, but addictive at the same time. The A4 has a real knack of drawing you in and it's easy to lose hours submerged in this box of delights! Recording a sequence on the A4 is pretty simple. There are four main sequencer tracks for each of the synth voices (with 64 steps over four pages), and you simply hit play and record for real-time mode (or just record for grid mode) and start playing via the onboard keyboard, or an external MIDI keyboard/pad controller. Whilst the onboard keyboard actually works quite well in practice, the keyboard buttons are too small for any intricate playing, plus they aren't velocity sensitive either (the Tempest's pads are much better in this regard). Also, it would have been much better if the keyboard button LEDs lit-up as they were triggered for keeping track of which notes are playing in a pattern. Thankfully, the A4 reacts to velocity, aftertouch, pitch-bend, mod wheel and more over MIDI. Note that whilst the A4 can send and receive MIDI controller info, it can't currently sequence external MIDI gear, but it can sequence external CV equipped gear in exactly the same way that you can sequence the internal synth. You can also route other instruments/ outboard back through the filters and effects too. Accent and mute functionality, plus parameter and note slide functions (for smoothing abrupt transitions between steps) are also available, and one really great feature is that when 'advanced mode' is selected each track can have its own independent length, so that you can get some really weird and wonderful polyrhythmic stuff happening. "The A4 can achieve pretty much anything you can conceive sonically"
You can also chain patterns together to make longer sequences in 'chain mode', then further order the patterns into a song form in 'song mode' much like an MPC or the Tempest. This is fairly easy to get to grips with, though it all relies heavily on the display. Also deserving of mention here is the six-mode arpeggiator (no synth is complete without one these days!) and there is one per track, including the FX and CV tracks too. During live performance you can instantly switch between patterns using the bank/group A to H buttons/ step buttons, and the switching mode can also be specified (such as waiting for the pattern to cycle to the end before switching). Any of the six sequencer tracks can be muted in and out to vary your pattern by pressing the function key, plus any of the track buttons and the LEDs can change colour to reflect the current on/off state, so that you always know where you are during your performance. One thing the A4 misses is a 'solo' button, and a second function key near to the track buttons so that you can perform one-handed mutes. Performance mode slickly gets around the fact that there are no fixed-function live performance dials, and you can set up what Elektron call 'Macros', which are essentially user-chosen controller scenes for the A to J dials. You can set up and save your favourite controller assignments so that you always know the effect of each dial upon a sound/track during a performance. For example, you might choose filter cutoff and resonance, effect sends and amp attack and release, then choose which sequencer tracks the dials affect. It's a very flexible system and the A4 can achieve pretty much anything you can conceive sonically, from warm leads to nasty overdriven snares and deep kicks, and it excels at snappy percussive sounds as well. "The effects engine really takes sounds into another dimension"
There are a few things that we miss in terms of live performance control, especially compared to our Tempest (which is probably the A4's nearest competitor). We sorely miss the 'Roll' function that allows you to do fills and beat-stutters in real-time, and there's no note repeat either; in comparison the A4 feels rather more static in terms of being able to do quick fill type variations on the fly. That said, parameter/sound locking, and the sheer number of parameters on offer, helps to offset this shortcoming, and the effects engine really takes sounds into another dimension. Changing pattern length, time signature and quantising on the fly means that your beats never have to sound too repetitive either. In terms of sequencer feel, the A4 feels equally as good as a Linn sequencer for tightness, swing and bounce, but with its own unique, perhaps more European feel. The nifty micro-timing function is also handy for subtly shifting feel in a track/ pattern, whilst quantise is not just on a global level, but on an individual track basis too. Another thing that's slightly frustrating is the lack of a quick revert or undo function for both live performance and recording - you can reload a pattern on the fly, but this relies on you having to save the altered pattern first if you want to return to it, which isn't great when performing. Maybe this can be improved in an OS update? "The A4 is an amazing little box that sounds polished yet raw and organic"
All things considered, the A4 is an amazing little box that sounds polished yet raw and organic, and it's inspiring to use once you have negotiated the initial learning curve. It excels at big basses, warped FX, punchy drums and dreamy soundscapes, and can go from subtle to in-your-face in the twist of a dial. The send effects are also great for adding space, movement, and stereo width to your patterns. Sure, there are missing features (and unfortunately only two audio outs), but Elektron are committed to improving and extending the OS, so who knows what's in store for the future? Regardless, it's killer for studio or live work and will appeal to electronic heads and sound design nerds alike. Above all, the price is right (less than a Tempest), and we love kit like this that you can really get lost in - we've already made music on the A4 that we couldn't have with anything else. If you're in the market for a new analogue synth/step sequencer with enough to keep you hooked for a long time, then look no further that the Analog Four. Another Elektron winner!